She was reminded of the myth here about Tangun -- the legendary first king of Korea -- that says a bear was the mother of the first Korean. Upon seeing firsthand the cruelty of the bear bile trade, Moon 58, founded moonbears.org, an organization that aims to put a stop to the bear bile industry in Korea, with her husband John William Walker in January 2007. “The bile is extracted directly from their gall bladders on a constant basis, which means constant agonizing pain,” Moon told The Korea Herald. Almost 1,100 Asian black bears are held captive in Korea, suffering in filthy and cramped conditions, often in cages no bigger than phone booths. Moon witnessed the extent of the cruelty after visiting bear farms. “I have been to a number of bear farms and they are disgusting,” she said. The bears often moan and rock due to extreme anxiety, and have broken teeth from biting on the bars of their cages. 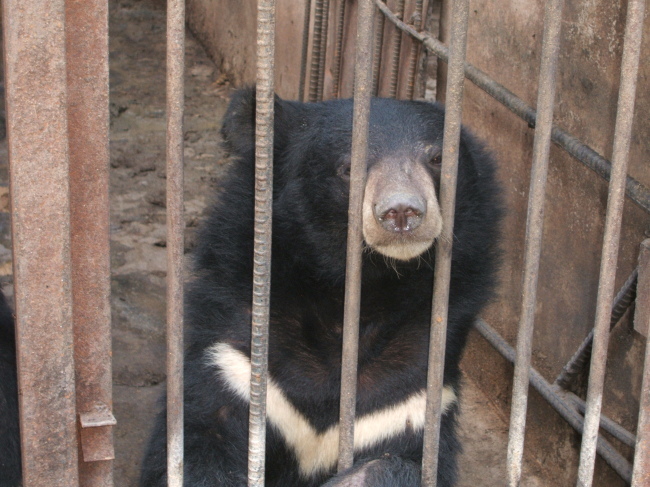 An Asian black bear in a metal cage at a bear bile farm in Korea. Their bile is extracted using an invasive metal catheter, which often causes infections and tumors. “Many of them have cancers from the way in which the metal drains are inserted into them. They are all simply living to die,” she said. A passionate animal activist, Moon has witnessed all sorts of animal cruelty. She has rescued stray dogs and cats in Hong Kong and Korea for years, and has rescued unwanted sheep and cattle in Australia. As an active member of Animals Asia, which rescues farmed bears in China and Vietnam, Moon saw the opportunity to launch a similar initiative here. “Interestingly Korean ‘bear bile tourism’ helps drive the farming industry in China and Vietnam too,” Moon said. The bear bile trade between Vietnam and the North Korea-Chinese border area of Yanbian has been booming since early 2000, with its industries selling bear bile products to tourists. Major Korean travel companies partner with Korean bear farmers who operate in these countries. “Usually tourists are not informed about the bear farm visit. However, it shows up in their itinerary when they arrive,” Moon said. World Animal Protection and environmental nongovernmental organization Green Korea United have been working to end the bear bile trade in Asia, but there are no specific anti-bear bile groups in Korea. The ursodeoxycholic acid collected from bear bile is used in Asia as traditional medication to treat diabetes, liver, heart and gall bladder conditions. While the acid does have some healing qualities for diseases such as diabetes, Moon said there are many inexpensive herbal and synthetic treatments that work the same way, as well as Western medicine. “The use of bear bile is simply unnecessary when there are many alternatives that do not involve animal cruelty,” she said. Bear bile farming is illegal in Korea, but over 60 bear farms continue to operate. “The authorities do not enforce the law. That is the real problem. It is all about enforcement,” Moon said. In the early 1980s, the Korean government kick started the bear bile industry here by importing 500 bears from neighboring countries, hoping to encourage urban communities to drive the export business. “The only solution here is that the government pays them compensation and then shuts them down, otherwise this will go on forever,” Moon said. Moon has travelled around Asia since 2007, particularly Hong Kong and Seoul, to raise awareness about the bear bile trade. Most recently, Moon and her husband spoke about the cruelty of bear bile farms at a Seoul International Women’s Association meeting in February. “Bears are strong and patient animals and this incredibly cruel and disgraceful form of farming takes full advantage of those characteristics,” Moon said. Her husband, John Walker, has published two children’s books on bears -- Ura’s World and Ura’s Dream. In June, the South Korean government authorized the registration of moonbears.org as an animal welfare charity. Moon and Walker are now laying the foundations to eventually build two bear sanctuaries in Korea. “These sanctuaries are important as many people focus just on stopping farming or freeing the bears, but the key thing here is showing them the dignity and compassion they deserve and to help them live out their final days in these places,” Moon said. “There is ample land in Korea owned by the government that can be used for sanctuaries and the running costs would be a fraction of what they spend now ‘pretending’ to regulate bear farms,” she added. Moonbears.org works with nongovernmental organizations locally and globally, including Bear Necessity, a subsidiary organization run by a former staff member. “We will persist with lobbying the Korean government and international community,” Moon said.